The Earth is a dynamic, wondrous, and complex planet. The diversity we see in the living systems, i.e. the Earth’s Biosphere, is the result of many processes studied individually among many disciplines including hydrology, geology, ecology, and soil science. In this course, we will take a holistic and integrating look at the complex spatial variations in the elements of Earth’s biosphere. 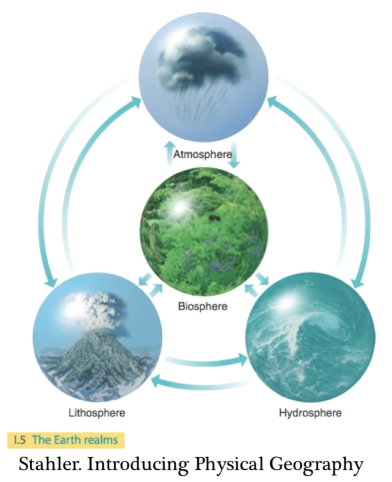 The Earth is made up of four spheres (Atmosphere, Hydrosphere, Lithosphere, and Biosphere; see image on right). Of these, the Biosphere is the habitat for all life forms and the focus of this course. The objective of this course is to have fun learning and to expand your studies of the Earth’s Biosphere. We will focus on spatial variations in Earth’s living systems ~ all of the patterns and processes that determine the composition (plants and animals) of different biomes around the globe. Note that humans are considered members of the biosphere too and, as such, the course also considers human activities in the causes and consequences of environmental change. 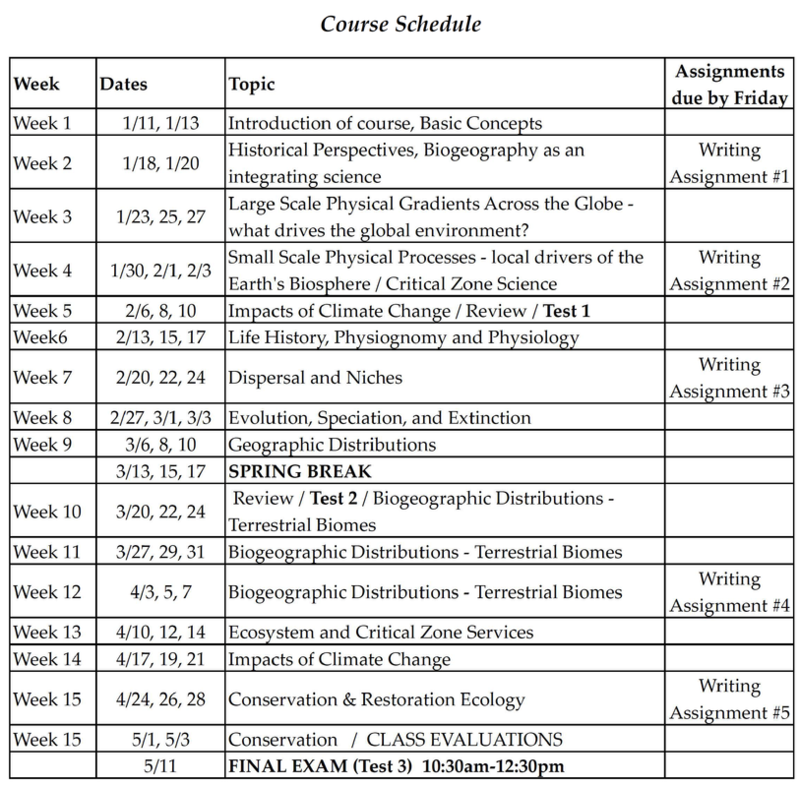 "Our Diverse Biosphere" is designed as a companion to other Tier Two courses in Geography, which cover the Climate System (GEOG 230: Our Changing Climate) and the Earth’s Landforms (GEOG 240: Our Dynamic Landscape). You should take these courses; they’re really good! Our strategy is to immerse non-science majors in the biological aspects of Physical Geography and, through lively debate and discussion, to enhance the critical thinking skills students need to make intelligent decisions about the world around them. Many of the concepts we will cover in this course have a direct link to future of science and humanity – our changing climate. In order to estimate where our world is heading, one needs to understand the drivers and constraints of life. This course is designed to give you that introduction. An additional aim is to give you a foretaste of one of our more advanced courses (i.e., GEOG 438, Biogeography) and some basic understandings of how the Earth works to find opportunities for active engagement (through lab or field experiments) offered within Geography.